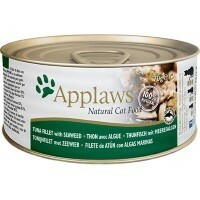 Applaws Adult Cat Food in Broth Tins (Tuna Fillet & Seaweed) have been developed with 100% natural premium ingredients in a delicious broth sauce. With high meat content, each tin is low in carbohydrates and packed with 70% protein rich tuna fillet. The seaweed is naturally high in iodine which helps support your cats overall health.